One of the major factors impacting the incidence and impact of parent involvement and student mobility, is the easy access and portability of student information. Access 4 Learning (A4L) Community Members in Washington State found there was a need for a Student Records Exchange (SRE) leveraging the current marketplace activities and ‘lessons learned’ from the development of record exchanges. In some states, 25-55% of the school’s student population switches schools each year. About 55,000 students transfer into WA state schools every year. About 42,000 transfer out of state. 41% percent of highly mobile students are low achievers compared with 20% of stable students. PK-12 institutions have problems receiving student data in a timely manner to allow educators to recognize the academic capabilities of students and place them in the appropriate learning areas. High mobility can have dramatic effects on school funding and can greatly impact staffing and calendar decisions for the school year. Seven districts around Seattle area have organized under the banner of the Road Map Project, a 10-year effort to significantly improve achievement. With 153,000 students and over 16,000 transfers per year, efficient Student Record Exchange is an important part of supporting the region’s highly mobile students. Why did Washington State choose xPress Student Record Exchange? 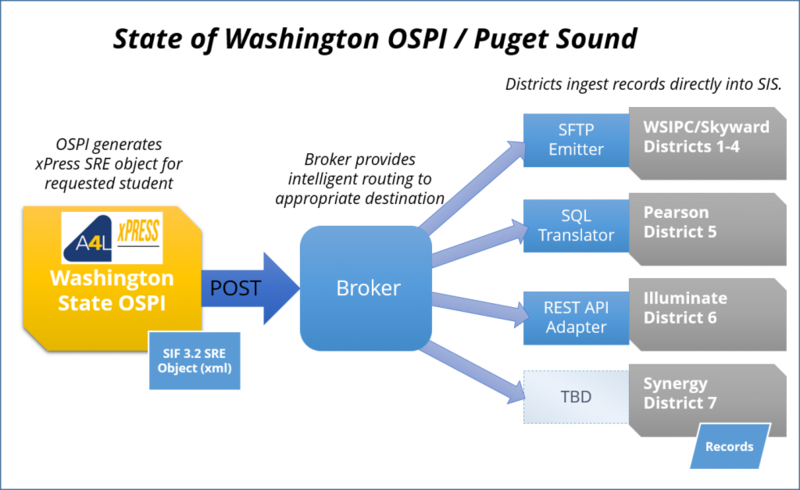 Washington State decided that it was a flexible, controllable and easy-to-implement architecture standard for finding and transferring student records electronically between any two education entities. Their approach was a multi-step, job based workflow, with recursive design and implementation flexibility, which had an ‘easy to use’ data model. This is just one example of how xPress Student Record Exchange is being implemented in the real world. Due to the flexibility and scalability of xPress APIs, there are many viable options for you to explore.